The Prayer Shawl Ministry provides a way to literally wrap people in prayer. Prayer shawls are knitted or crocheted by members of our parish and then given to those who are in need of our prayers. The shawl provides a visible symbol of Christ's presence and care. The group meets on the third Tuesday of the month from 7:00 p.m. - 8:30 p.m. in the Ministry Center Meeting Room 121. 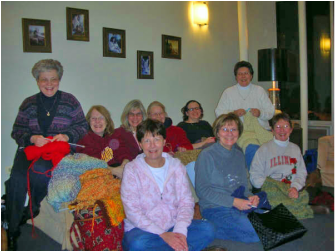 If you are interested in being a part of the team that knits and crochets, contact Sister Marianne at (847) 882-7580.